Like many people, I’ve put in a good amount of time watching internet clips of cute babies/kittens/puppies/parrots/etc on YouTube. While the videos range from ridiculous to fairly amusing, I recently found myself totally captivated by a video featuring a baby who uses sign language. What at first glance appeared to be yet another cute baby making faces video quickly took on an added dimension. I noticed this baby doing something with her hands. Over the next few minutes I came close to rubbing a bald spot on my chin because of my amazement. Watch the video, I highly recommend turning your sound on. 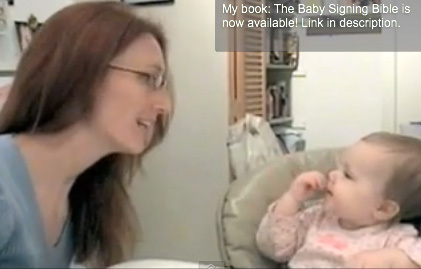 The child in the video is a one year old girl and her parents started training her using sign language at an early age. The fascinating part is that, although she was able to say a few words, a good portion of the words that she was able to sign she wasn’t able to say. In fact, according to the norms of child development, babies usually aren’t able to ask for foods by name until they’re 18-24 months old, but she does this in the video with signs. At a year old they have a vocabulary that can be counted on both hands. This is not for lack of cognitive ability. It turns out that as children grow, their hand-eye coordination develops much more quickly and at an earlier age than their speech abilities. While there are many muscles in the human hand and arm, there are many more in the face and throat that are required for making intelligible sounds. So because they’re able to exhibit comprehension at 12 months old, they’re also able to mimic giving commands or requests at 12 months old. While their vocal ability takes longer to develop, babies, it seems,have the cognitive and physical ability to communicate by making signs or approximated signs. Young children are much more intelligent than many people give them credit for. Baby talk is a symptom of this attitude towards young children. Really, babies are able to understand adult speech. Children grow rapidly and are constantly learning new things that they want to be able to communicate. The problem is they often don’t have the vocabulary. All of the articles concerning infant singing and other research that I’ve read say that the temper tantrums associated with the 1-3 year olds (the terrible twos) aren’t an inherent part of a childhood. Multiple language learners will identify with this example. There’re days when you’re having a nice conversation in a language different than your native language, and you just get stuck on a word. When that happens you can’t remember the translation and can’t quite explain what you mean. This creates natural feelings of frustration and anger. Now imagine yourself not only not having the word in another language, but not having a word in the only language that you know. It’s entirely understandable that young children break down, they’re full of excitement and they lack the words to be able to share it. Also there an excellent book about baby signing by two of the original academic researchers in this field; it’s called Baby Signs: How to Talk with Your Baby Before Your Baby Can Talk. The authors are Dr Linda Acredolo and Dr Susan Goodwyn.